Brian Wood is nothing if not pretty restless when it comes to writing comics and it looks this summer his streak of staying active will continue. 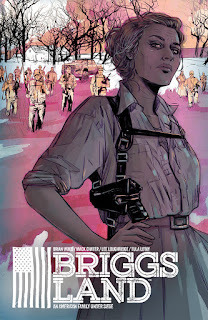 That's because he's teaming up with Mack Chater, Tula Lotay and Lee Loughridge for Brigg's Landing, a new series from Dark Horse. And not only that, but he's also developing a television adaptation of the comic for AMC, serving as writer and executive producer, with producing partners John Hodges and Ravi Nandan at A24. Briggs Land #1 is in stores August 17, 2016. Full press release below. FOR IMMEDIATE RELEASE: MILWAUKIE, OR— From New York Times best-selling writer Brian Wood (The Massive, Rebels, DMZ, Channel Zero) comes an electrifying crime saga relevant to current world events:Briggs Land. “AMC and I have been looking for the right thing to work on together for years, and it finally came in the form ofBriggs Land, a crime drama set within a rural secessionist community. It’s the culmination of everything I’ve done in my twenty years as a comics creator, bringing socially conscious and politically charged themes to the page, putting some of the more unsettling elements of American culture under scrutiny,” noted Brian Wood.